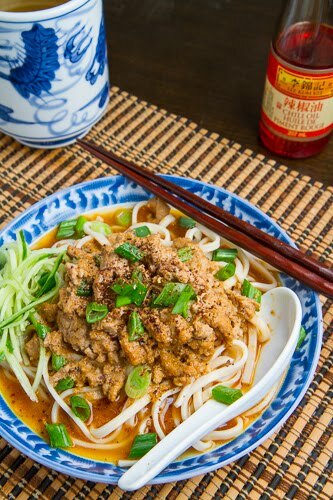 Noodles in a tasty and spicy Chinese Sichuan chili, sesame and pork sauce. The bang bang chicken that I made a few days ago reminded me of another one of my favourite Sichuan dishes, dan dan mian and that is not too surprising given how similar they are. 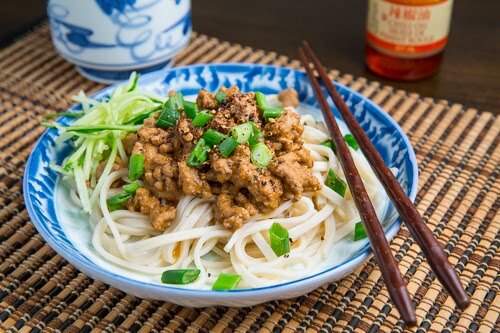 Dan dan mian or dandan noodles is a Chinese Sichuan dish consisting of pork and preserved vegetables in a spicy chili oil based sauce with Sichuan peppercorns that is served over noodles. 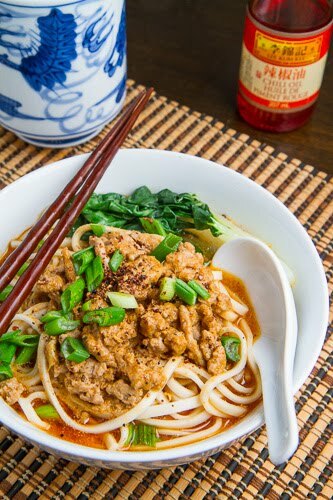 There are many different variations on dan dan noodles and one common one is to add sesame paste which makes the sauce very similar to the bang bang chicken sauce. I first came across dan dan noodles on Appetite for China a number of years ago and I had to make it right away! Unfortunately I was never completely satisfied with the photo that I took to go along with the recipe so I seized the impending Chinese New Year as an excuse to update the photos! While I was doing some more research on dan dan mian I came across several photos where it looked like the sauce was much more broth-y almost like more of a soup as opposed to the thicker almost ragu like sauce that I had always encountered. I liked the sound of the more soup like version and so I added a bit more chicken broth to the recipe than I normally do and it turned out great! The original, thicker sauced version is above, the more soup like sauce version is below and I definitely prefer the more soup like version! Slurping noodles is always fun and it is even better if they are in a broth! Serve with mouth cooling julienned cucumber or juicy steamed baby bok choy along with extra chili oil or sauce for those that like it hot! Cook the pork in a large pan over medium heat hitting it with a splash of rice wine, about 10 minutes and set aside. Heat the oil in the pan over medium heat, add the garlic and ginger and saute until fragrant, about a minute. Add the sesame paste, soy sauce, black rice vinegar, sesame oil, sugar, chili oil and Sichuan peppercorns and mix until smooth, about a minute. Add the pork, preserved vegetables and broth and simmer for 3 minutes. Divide the noodles between 4 bowls, top with the sauce, garnish with green onions and a side of cucumber and enjoy! Option: For One-Pan: Make this a one-pan meal by adding 8 ounces of pasta and 2 1/4 cups broth or water (or 1 cup of rice and 2 cups broth or water) to the sauce in step 4 and simmer, covered, until cooked, about 12 minutes (or 20 minutes for rice). Note: Use 1/2 cup of chicken broth for the thicker version and 1 cup or more for the more soup like version. Note: If you cannot find the sesame paste tahini or even peanut butter can be used as a substitute and if you use peanut butter, chopped peanuts are a great garnish that adds a nice crunchy texture. interesting… you used udon noodles huh? I traveled China in Jan and had the best noodles in Guilin (Gui Lin Mi Fen),and they kinda looked like your dan dan mian. Now Im craving it. That is a great story. Persistance pays off! It’s a beautiful recipe. I might have to hit up Chinatown in San Francisco next time I’m there. I can’t say that I’ve ever heard of Dan Dan Mian; but ANYTHING with peanut or sesame sauce is a winner, in my opinion – yum!! That’s a good idea Kevin (writing the Chinese name of the product on paper) because all I get is blank stares when I ask for an item. YUM. What an intriguing sounding recipe. Wow–you were determined to get those Sichuan peppercorns! The dish looks great–totally worth the effort. That looks so good!!! Sounds like a great Sunday night dinner to me!!! Sichuan food is still something I’ve been dying to make more of. I’ve got so many peppercorns to play with, it’s crazy! Thanks for the recipe! Awesome! Another great new idea to try! looks great! variety, this is what i love about your recipes/blog! peanuts and sichuan flavours-what a winner. that looks soo good! it’s so pretty too! I just want to dig into that right now. cool, u really work hard to find the szechuan peppercorns. That means more wonderful asian recipes to come, heh. So how do you pronounce Sichuan? Very smart! Now we should see you wandering Chinatown more often, list in hand! 🙂 I love Sichuan anything! unfortunately, there’s no source for asian ingredients anywhere near me. i suppose regular peppercorns will just have to do because this recipe is very enticing. That looks so good Kevin. I love peanuts in cooking, so i bet I’d love this. Guess what I’ll be looking out for next time I’m in China Town shopping!? I love sezchuan peppercorns too but I did have a bad experience a few years ago when I used too many in one recipe. If you overuse them , they take on a really weird and powerful taste – it’s not pleasant! Your noodles look delicious though, I love adding peanut to savoury dishes, the obvious one being pad thai, one of my faves! Sounds great Kevin! I bet your kitchen was filled with wonderful smells as you were cooking this dish. This is another great idea to try out..
Wow… First of all, I thought I detested this dish – it’s “recommended” at PF Chang’s, and quite honestly, their’s was not appetizing. However! yours, my dear, looks quite delicious – and udon noodles… yum! Glad you got those peppercorns! Yet another yummy looking dish I want to try! I love spicy Schezuan peppercorns! I think this dish would be lovely with thick rice noodles too. Fantastic Kevin. I’m waiting for you to start a new business running tours through Kensington Market and Chinatown for people who need to learn where to find ingredients for culinary adventures. You have incredible persistence. I love anything with a peanut sauce, but my husband doesn’t, so I don’t get it very often. This sounds so delicious, though, especially with that heat! I was looking for something to make for dinner last night and happened to be reading your blog. I decided to make these Dan Dan noodles and it turned out great — very spicy and tasty! I only added a bit more peanut butter (that’s my favorite part). Kevin, I just awarded you:) Please see my blog for details. I love dan dan mian! Sichuan peppercorns are the type of spicy that builds up. Usually by the end of the meal, my mouth is on fire, but I still love it! I think you would love korean bibim guk soo.. They’re SUPER spicy! I am such a huge fan of Sichuan food (and pork). For a while szechuan peppercorns were banned from being imported into the US. I remember in the early 90’s in the SF Bay area eating fantastic Sichuan food at a local restaurant that made my mouth zing. Love it! And love your dish. Too funny. You sure were bound and determined to get what you needed, huh? Asian noodle dishes are my favorite. Especially with peanuts! This looks fabulous, Kevin! I love peanut sauces like this. I’m definitely trying this one. I love Dan Dan Noodles, but they’re quite difficult to make. I’m very particular about my noodles and they have to be just the right texture. I like mine with pork (like you have!) and it has to have just the right amount of heat. My favourite version is at my local restaurant and I’ve tried to replicate it but have been quite disgusted with my attempts. I’ll have to try your version because it looks tempting! hi kevin ,Excellent recipe, we live in china and I know how delicious this recipe is with sichuan pepper corn mesmerising the tongue.I have got tempted to try out soon at home. It’s so funny. I think I would like that dish. What a great idea to write down the chinese word! Yum this is one of my favorites! You found some huajiao! That sure is persistence. Looks like it paid off, though! Unlike you I do have the peppercorns in my pantry. so thanks for the idea. Are you using toasted or untoasted sesame oil in the recipe – the flavors are so different, I don’t want to use the wrong one! Jenn: I used toasted sesame oil. I actually used to live in Chong’qing in Szechuan and hawkers sold this at every corner! The locals love it and seem to have absolutely no limit in the amount of chilli oil they spooned onto it. It’s an amazingly easy dish to make and my mother often does it when she goes home late from work. It works better with thin noodles though. And you can even have it with a chicken stock soup base for those cold winter nights. Dropped in on my local Asian market, the kids work with mom and dad so they speak very good English, they informed me that Szechaun peppers are almost always sold as Chinese prickley ash. I have 3 Dan Dan Noodle recipes, but this one is still different and looks great. I've had great success with your recipes – thanks for your attention to detail! I grew up eating Dan Dan Mian and your recipe looks great. Thanks for sharing! I love spicy food and this noodles recipe looks delicious. there are so many places i've been to that cannot do dan dan right. i have to go into boston to chinatown to get a decent bowl of it. a nice 1 1/2 hour drive. so i need to print this out. This was awesome!!! Made it tonight and just finished eating with the family. The recommended amount of Sichuan peppercorns brings just the right of numbness on the tongue. I took the middle ground and went with 2TBS of Chili Oil, and it worked out perfect. I believe 3TBS would be fine also as it provides more flavor as opposed to hotness in my opinion. Keep up the great posts! I used to eat Dan Dan noodles quite a bit but we stopped going out so much and I haven't had any in quite a while. This recipe makes me wish I had a bowl of them in front of me right now!